The current trend in journalism and certain museum circles to put forward the idea that the dearth of racial diversity in curatorial roles in U.S. “museums” stems from a lack of qualified candidates ignores the fact that culturally-specific museums have long histories of training, hiring, and exhibiting art and culture of Black people and other people of color. The constant erasure of their work is purposeful. It obscures the entrenchment of structural racism in so-called “mainstream” museums. To create equitable centers, it’s essential to know the histories of museums across sectors and to study how racism and anti-racism measures have operated in this country. The August 2018 issue of The Public Historian, the journal of the National Council of Public History, is another important resource for grasping a deeper understanding of the state of the museum field. Knowledge is power. Huge thanks to the organizers of the Association of African American Museums conference, #AAAM2018, for this gift to conference attendees. Student dancers and musicians greet AAM2018 conference attendees as we arrive at Hampton University Museum to honor its 150 years of cultural leadership. 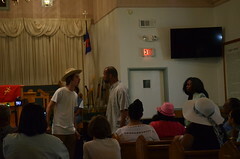 August 10, 2018, Hampton, Virginia. As we recognized the 40th anniversary of the Association of African American Museums organization at this year’s conference, we also celebrated the 150th anniversity of Hampton University Museum. Black museums have been around for a long time! Their origins relate to this nation’s disenfranchisement of people of African descent. These centers should be models for leaders of traditionally white museums who include increasing diversity of staff and visitors as institutional goals. A reframing that acknowledges structural racism might lead to tackling systemic issues. The August 2018 issue “State of Black Museums” is available online for free for a limited time. I’ll add it to my Social Justice & Museums Resource List. We need a record of the record. Slaves. Fugitives. Runaways. Slave mistress. Our books, learning, teaching and imagination are steeped in limited frameworks. These terms reinforce the culture of dehumanization. Yet they often remain central and unchallenged forces in our lexicon. Recently I followed a scholarly discussion via Twitter that highlights the trouble of this convention. Several historians reflected on their processes for finding words that better contextualize the truth of slavery. They also mentioned resistance they’ve encountered from editors who find their alternate expressions cumbersome. On several occasions I’ve experienced opposition when I didn’t generalize oppression. The intransgience of some academics, museum professionals, and publishers can trip up, or even repel, those who are just entering these fields. It is disheartening. However, it is not surprising. Ideologies of white supremacy and colonialism are foundational in these domains. Fortunately, some scholars, curators, educators, artists, students, designers, and others continue pushing at oppressive frameworks. We need to know who they are, how they work, and what they’ve created. We need to imagine what can we build together. Thanks to hundreds of supporters we raised $5669.79 for the Southern Poverty Law Center! 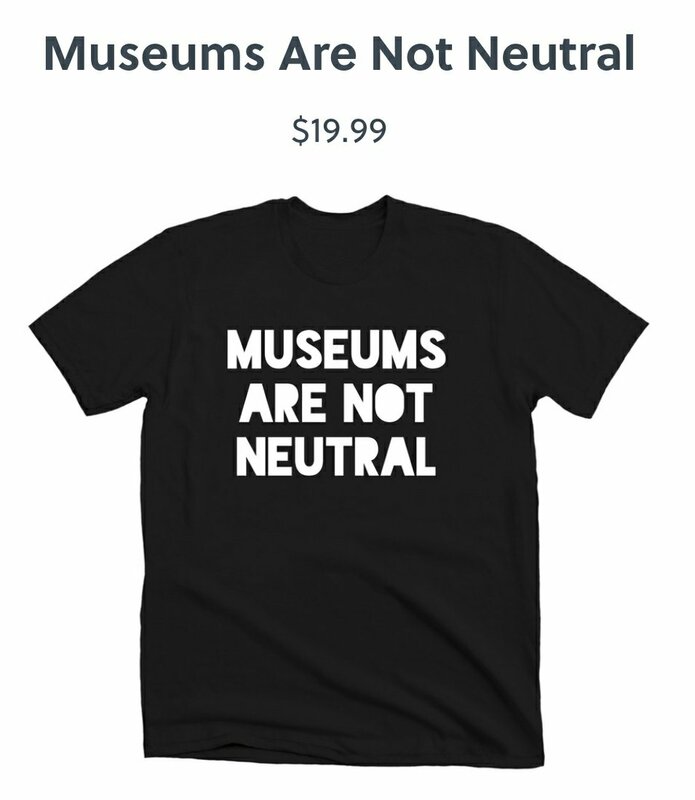 Today Mike Murawski and I relaunched our #MuseumsAreNotNeutral campaign to keep the dialogue going as we challenge the myth of museum neutrality. Letting everyone know that museums are shaped by and participate in sociopolitical arenas is the first of many steps to making our museums equity-centered institutions. Now we are offering a few more colors and the proceeds will support Unidos Por Puerto Rico, United for Puerto Rico, an initiative providing assistance to those in Puerto Rico affected by the passage of Hurricane Irma and Hurricane Maria. 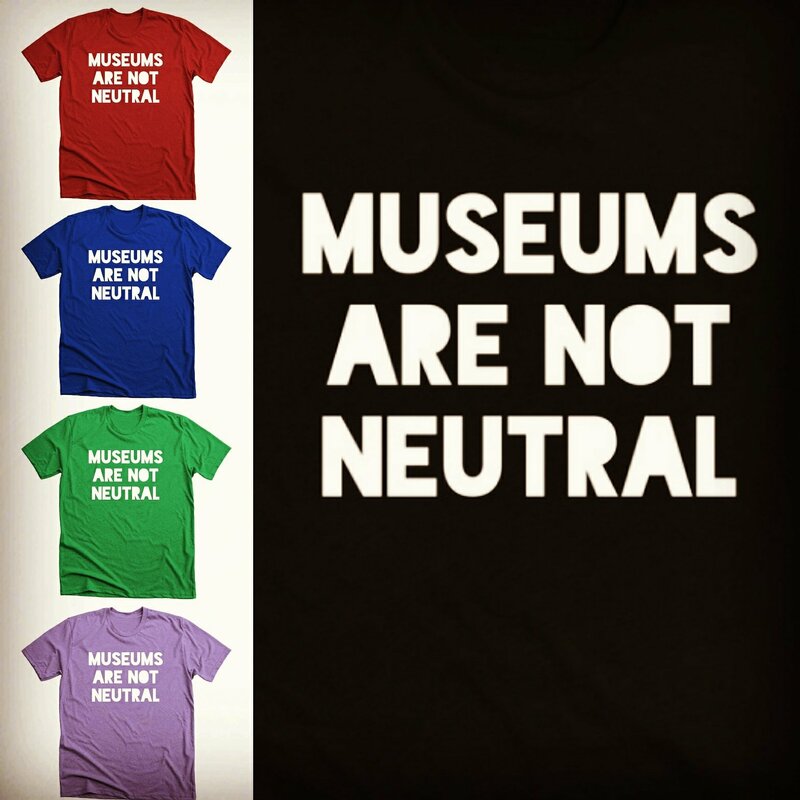 If you can, please purchase a shirt and share your pics with our hashtag #MuseumsAreNotNeutral. Last summer I co-founded the Museums and Social Justice Reading Group with two colleagues from Yale University Art Gallery. We held a few gatherings off-site at local eateries and grappled with some difficult topics such as concepts of empathy, the possible roles of empathy in art museums, and how social justice might apply to art museum spaces. While I had started my Social Justice & Museums Guide, open listing of resources, months before our group formed, I realized that it could serve as our un-official syllabus. (Museum professionals from areas across the U.S. have contributed suggestions to the list.) When I mentioned the reading group on Twitter, several colleagues expressed interest in joining via a digital platform. 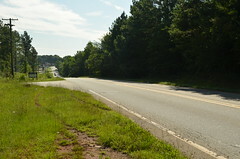 I liked the idea; but I decided to hold off on extending our project because we were in the initial stages. Unfortunately, we didn’t have many gatherings because life happened. Our busy schedules dampened our energies. Even so I continue to mull over several of the discussion points we engaged. Down the road I plan to return to this initiative. Recently I did send one last note to my fellow Museums and Social Justice Group members to serve as a farewell to that iteration of our endeavor and an invitation to continue what we started in other ways. Below I’ve shared an adapted excerpt of that message as it spotlights significant calls for authentic commitments to critical reflection and social justice in our museums. These efforts deserve serious attention from curators, artists, educators, and others who care about the arts and humanities. This letter also highlights the next steps of my career journey. While I have enjoyed curating my recent exhibition Let Us March On: Lee Friedlander and the Prayer Pilgrimage for Freedom, it has meant that my schedule has been jammed pack. Regretfully that stymied my ability to continue co-organizing our Museums and Social Justice Reading Group. Now I’m just about to complete my fellowship at Yale- Friday, July 14th is my last day. I’ve learned a great deal during my time at here and will miss many people. As a parting gift, I would like to share a few more articles with you. In February, the Davis Museum’s decided to remove art made by immigrants as response to Trump’s Muslim ban. Later in May, in concert with NEMA, Margaret Middleton, a museum professional based in Providence, RI, organized a panel to discuss the museum’s project. 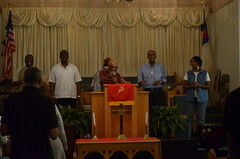 Pampi, one of the co-panelists, wrote a rich reflection about the gathering. Below please find links to essays by Pampi and Annie Wang, a Wellesley alum who critiqued the museum’s gesture much earlier. I feel that both authors did a good job at highlighting the Davis Museum’s lack of self-criticality. Back in February, many art publications mentioned the museum’s decision. But I didn’t see any articles that put the lens on the inherent problems that many art museums would engage by pointing the finger at others about exclusionary practices. Moreover, most art writers failed to discuss how a ban against a particular ethnic group is different than one against all immigrants. Pampi and Wang challenge all who both care about museums and support social justice to think deeply about how we can institute self-reflection and self-critique in our museums while negotiating the slippery terrain endemic to the colonialist origins of museums, trendiness of institutional inclusion rhetoric despite prevalent current practices and longstanding histories of exclusion in our museums, and the stated desire to be relevant in contemporary society. Tall order! The table of contents of the current issue of The Journal of Museum Education, Volume 42, No. 2, Summer 2017, “Identifying and Transforming Racism in Museum Education” looks fantastic. I haven’t gotten my hands on the journal yet. But I am eager to read the articles. Next month I will begin my new joint position as Curator of Art and Civil Rights at Mississippi Museum of Art and Tougaloo College. I plan to infuse my curatorial and teaching work with studies of the relationship of social justice to museums. While I question the possibilities of change within existing frameworks at most art museums in the U.S., I continue to envision a future where more of our art centers are grounded in anti-racist and equitable labor practices. It’s going to require much more critical praxis to make enduring intersectional, structural changes. Thank you for taking part in my initial efforts in this area during my time at Yale. I look forward to more conversations. If you are also committed to this work, please do keep in touch. You can also find me on several social media platforms under the digital handle Artstuffmatters.